As we work our way around afternoon thunderstorms in South Florida, our sense of the air is at its peak. We are in tune with the waves of turbulence and the edges of the storms as we work radar, visual and the seat of our pants to find the safest path through the storms. This is the nature of working in the summer air and it can be as exhilarating as it is challenging. 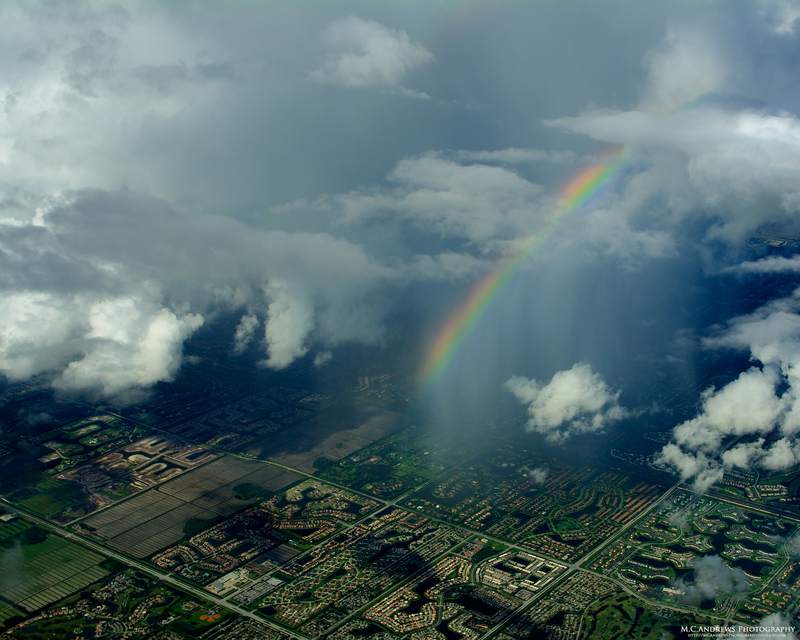 Once we arrive on the sunny side of the weather, it is time to look for our reward…Behind us, a rainbow forms in a shower as it sweeps across the planned neighborhoods and country clubs of Boca Raton. Starting as a glint of light in the criss cross of angular sun rays and vertically waving showers, the rainbow grows and stretches into a full blown arching bow. This was a great one…intense, bright and a fully defined spectrum of light. Next time, I invite you to lift your window shade, look outside, and share in this reward. Thanks. It’s always a wonder to see. I love how the rainbow looks suspended on a mist. That’s the most intriguing part of watching it grow. I saw this one coming and captured each stage as it stretched into a full bow. Thanks for commenting.